This was a fun short read. Yes, it is a children's book ...and yes, I really enjoyed it. My parent's had these books growing up and I loved reading them. 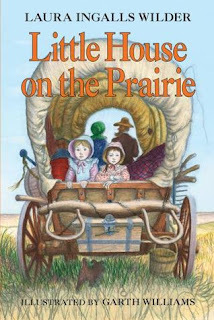 Its so exciting to read about a little girl's adventures in the wild west. So much more intriguing than playing "Oregon Trail". The book basically goes through their leaving of their house in the "Big Woods" and the struggles by covered wagon and the heartaches and beauty of starting life again in a completely different place far away from anyone they knew and crawling with hostile indians. Reading this book gave me a fresh perspective on how easy we actually have it and an attitude check on how this little Ingalls family rolled with the punches and even with a smile and a song. The last chapter shares the part of their story where the government decided they need to move on out of Indian Territory so they pack up in one morning, leave everything... their freshly planted garden, their hard worked for and earned well, the cabin and barn that they labored for log by log... and head out again in their wagon to go further west. After they have travelled for a bit, they come across another family in a broken down wagon with no horses (they were stolen). This family refuses to leave their wagon to go get help because everything they own is in the wagon. The Ingalls Family drives away after begging to help by taking the dad to the closest "city" to get help, but with being refused. It just struck me as such a stark difference between these two travelling families. Both families left their homes and everything they knew, but one family forsook everything where as the other family couldn't bear to possibly part with everything. It made me think... and I willing to forsake everything for the sake of Christ? ?